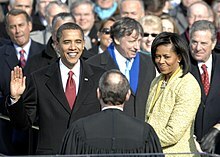 Delivered on the West Front of the United States Capitol Building in Washington, DC on 20 January 2009, before a record audience (Presidential Inauguration Committee); 18:31 in length. Today I say to you that the challenges we face are real. They are serious and they are many. They will not be met easily or in a short span of time. But know this, America — they will be met. On this day, we gather because we have chosen hope over fear, unity of purpose over conflict and discord. On this day, we come to proclaim an end to the petty grievances and false promises, the recriminations and worn-out dogmas, that for far too long have strangled our politics. In reaffirming the greatness of our nation, we understand that greatness is never a given. It must be earned. Our journey has never been one of short-cuts or settling-for-less. It has not been the path for the faint-hearted — for those who prefer leisure over work, or seek only the pleasures of riches and fame. Rather, it has been the risk-takers, the doers, the makers of things — some celebrated but more often men and women obscure in their labor, who have carried us up the long, rugged path towards prosperity and freedom. For us, they fought and died, in places like Concord and Gettysburg; Normandy and Khe Sanh. Time and again these men and women struggled and sacrificed and worked till their hands were raw so that we might live a better life. They saw America as bigger than the sum of our individual ambitions; greater than all the differences of birth or wealth or faction. As for our common defense, we reject as false the choice between our safety and our ideals. Our Founding Fathers, faced with perils we can scarcely imagine, drafted a charter to assure the rule of law and the rights of man, a charter expanded by the blood of generations. Those ideals still light the world, and we will not give them up for expedience's sake. And so to all the other peoples and governments who are watching today, from the grandest capitals to the small village where my father was born: know that America is a friend of each nation and every man, woman, and child who seeks a future of peace and dignity, and that we are ready to lead once more. To those leaders around the globe who seek to sow conflict, or blame their society's ills on the West — know that your people will judge you on what you can build, not what you destroy. To those who cling to power through corruption and deceit and the silencing of dissent, know that you are on the wrong side of history; but that we will extend a hand if you are willing to unclench your fist. Our challenges may be new. The instruments with which we meet them may be new. But those values upon which our success depends — honesty and hard work, courage and fair play, tolerance and curiosity, loyalty and patriotism — these things are old. These things are true. They have been the quiet force of progress throughout our history. What is demanded then is a return to these truths. What is required of us now is a new era of responsibility — a recognition, on the part of every American, that we have duties to ourselves, our nation, and the world — duties that we do not grudgingly accept but rather seize gladly, firm in the knowledge that there is nothing so satisfying to the spirit, so defining of our character, than giving our all to a difficult task. ↑ While Obama was the 44th person to serve as president, only 43 people had taken the presidential oath as of 2009; Grover Cleveland is counted as the 22nd and 24th President due to his non-consecutive terms (in 1885 and 1893). This page was last edited on 16 May 2018, at 19:35.